Order fibre this Black Friday weekend and save up to R11000! Don’t miss out! 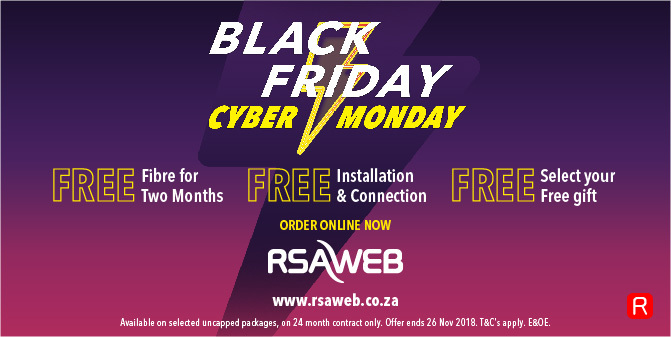 This Black Friday RSAWEB is giving you massive savings on Fibre with their biggest fibre deal ever. Order any uncapped, 10 Mbps or faster package this weekend and get two months free, free connection, free installation, and a freebie of your choice: a Redragon 3 in 1 gaming combo, a GoFreetech NFC enabled Bluetooth speaker or a Kwesé Play Roku powered streaming device. Grab it quickly though as stocks are limited! This great deal comes in addition to all the other savings you get with RSAWEB like a free premium WiFi router, free LTE SIM card with 1 GB of free data each month, free one-hour onsite support and up to R2500 off when your referrals get connected. This Black Friday promotion is valid on 10Mbps and faster, uncapped packages, 24-month contracts only. Give your home the best connectivity for so much less this Black Friday. Get fibre and give your home a clear reliable connection at insane speeds of up to 200Mbps. You’ll be doing all the things you love online, faster and better than ever before; get your game on without any lag, work from home without interruption, download and backup files faster than ever, and stream everything in HD, buffer-free. Give your home some serious speed while you give your budget a break this festive season — get your two months of free fibre internet with all the other awesome freebies from RSAWEB this Black Friday.